Moms are constantly piling new things to their plates; if not in their minds, then literally on our plates—hence the dreaded mommy weight gain! As their to-do lists continue to grow, they always (somehow) ﬁnd a way to add even MORE to their smorgasbord of STUFF. It just never ends. Once upon a time, it was enough that women ran the household and raised the children—now they have added so much more to their plates. Women now have more roles than a French bakery! Danielle Formaro is a mother and entrepreneur. She graduated from Syracuse University in 2001 with a Bachelor of Science. She has been working in the restaurant and hospitality business for twenty-two years with thelast ten years dedicated to special event management. In 2010, she opened a French restaurant called Central Bistro, located in the heart of downtown Boston. Danielle is an AFFA certified fitness professional. In 2012, she successfully launched a fitness business, offering lifestyle, nutrition, and coaching to new and seasoned moms. Danielle is also a published Author. 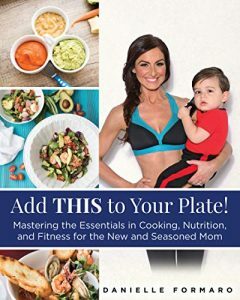 Along with children’s books, Danielle is also actively writing new and exciting personal development, fitness and family cookbooks. Danielle currently resides in her hometown of Burlington, Massachusetts, with her son, Giorgio.